When you see a product labelled as “natural”, it’s easy to assume that this product is healthier than alternatives not indicated as such. 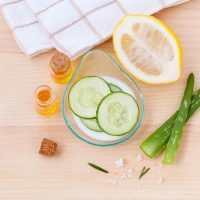 However, just like some synthetic ingredients are better than others, there are certain natural ingredients which have more benefits and are better for you than others. This nutrient, found in carrots, pumpkins and sweet potatoes, can have a powerfully beneficial effect on your skin. Beta-carotene that your body takes in is converted into vitamin A, which can protect your skin from sun damage and help wounds to heal. This nutrient is also beneficial when applied directly onto the skin. “Topical beta-carotene has antioxidant benefits on the skin and research has reported that it improves discolouration due to melasma,” dermatology guru Jessica Wu has said in words cited by Everyday Health. When you want to take a sip, you might want to leave the alcohol untouched in favour of drinking green tea instead. Antioxidant chemicals, including catechins and flavonoids, are abundant in this drink. Those chemicals can effectively treat UV-damaged skin and, even if your skin isn’t damaged in this way, soothe it as part of a healthy skincare regime. She also notes that “oat lipids and proteins help replenish and maintain the skin barrier”, though she urges that people seek colloidal oatmeal in particular. Colloidal oatmeal has more benefits – and has also been the subject of more research – than other oatmeal products. Stacking up on oranges isn’t only good for preventing yourself picking up a nasty cold. It can also prevent your skin looking more saggy and dull and, thus, older. This vitamin helps ensure firmness and smoothness due to how it assists with collagen synthesis. Vitamin C can also lighten dark spots, help treat free-radical damage and regulate sebum production (good for preventing acne). Eating lots of citrus fruits is a good idea, as is looking for vitamin C in serums and creams. Coconut oil is one of those beauty products which can be used in many different ways – in skincare, haircare, bodycare and much more. As an ingredient, you can find unrefined coconut oil even in ‘oil pulling’ products such as the ones from The Big Fruit. This form of coconut oil – rather than MCT oil or “fractionated coconut oil” – contains lauric acid which, in the process of oil pulling, can help treat your teeth to make them look whiter and, thus, more aesthetically pleasing. So these are our top picks of natural ingredients which you should look for in a natural product. Now go and check your current products, do they contain any of these ingredients? Can you tell me something for hairs?